What could be better then pure Vermont maple syrup boiled down and made into maple sugar, then used to coat mixed nuts? If you like mixed nuts, or you know someone who does, then this is one of the best mixed nuts gifts you'll find online. The sugared nuts are both chewy and crunchy. 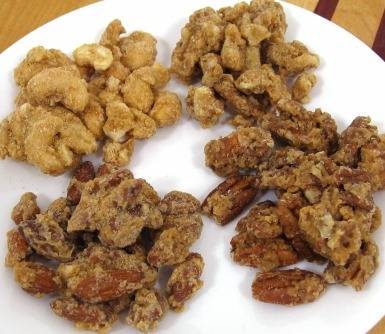 The syrup, used to bond the maple sugar to the nut, makes the nuts a little chewy. The nuts give the treat CRUNCH! Available in a 4 oz. 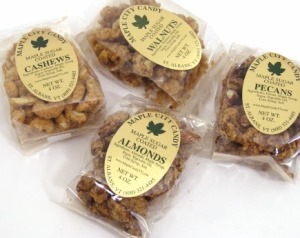 package of maple sugar coated almonds, cashews, pecans, and walnuts. 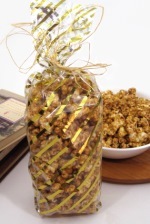 Makes a wonderful office gift for hungry co-workers! For a closer look at the sugared nuts, click on the image to enlarge.